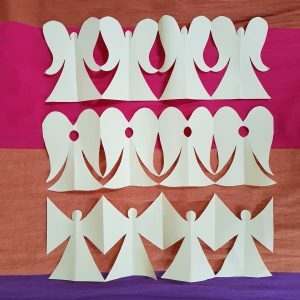 Create angel bunting by cutting out multiple sheets of concertina angels. We used A3 paper, as it gives you bigger angels, but you could use A4. Start by folding the paper in half so you have a long rectangle (folding long edge to long edge). Then fold the long rectangle in half, short edge to short edge, and again in the same direction. You should end up with a folded wodge of paper with one side all folded and the other with one end of the sheet showing. Draw half an angel along the folded edge, i.e. with the head and body along the fold and the wings / arms / legs / robe going out towards the other edge. 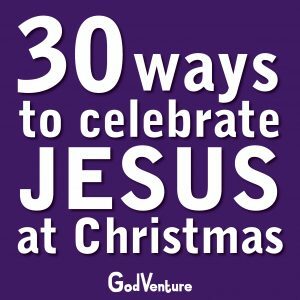 Make sure your angel has at least one, and preferably 2 points touching along the outer edge as these will ensure it is attached to the next one. Cut out your angel and unfold and you should have a set of four angels. “That evening two angels arrived in Sodom, while Lot was sitting near the city gate. When Lot saw them, he got up, bowed low, and said, Gentlemen, I am your servant. Please come to me home. You can wash your feet, spend the night, and be on your way in the morning. Here’s a list you could work through! You can decorate your angels then use them as decorations.